﻿ Solar photovoltaic (PV) system surge protection - Project & Solution - Fatech Electronic CO., LTD.
Not only house owners install a PV system on their rooftop but also private operating companies make more and more investments in shared systems, which are erected on large-surface roofs, on traffic structures, or unused open areas. 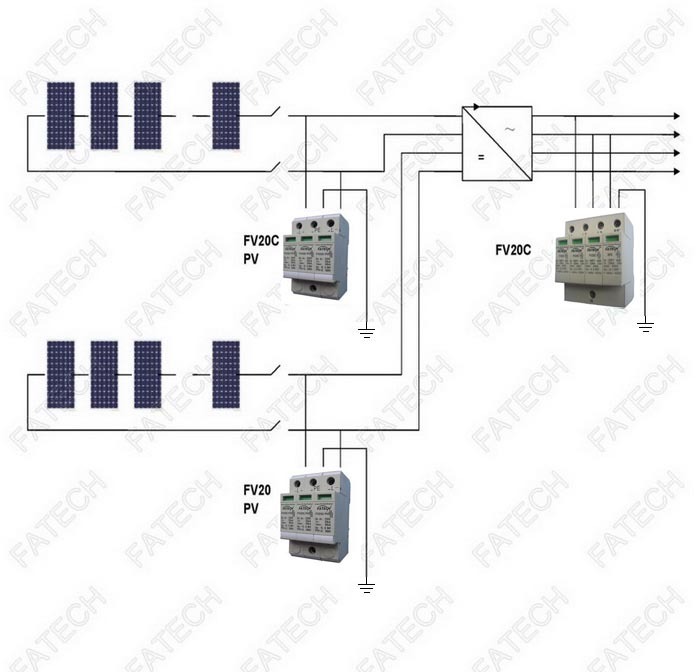 Causes for surges in PV systems are inductive or capacitive voltages deriving from lightning discharges as well as lightning surges and switching operations in the upstream power supply system. The following diagram shows the surge protection concept for a PV system on a building without lightning protection system. Possible installation sites of the surge protective devices can be: Generator junction box, DC input of the inverter, 230 V side of the inverter.